152nd Sunday newspaper story; 2 Jan - 30 Jul 2000. 51st Sunday newspaper story; 3 Aug - 21 Dec 1958. Previous Frew appearances: #328, #482, #660, #869. 53rd Sunday newspaper story; 21 Jun 1959 - 3 Jan 1960. Previous Frew appearances: #325, #479, #656, #865. 54th Sunday newspaper story; 10 Jan - 22 May 1960. 75th daily newspaper story; 5 Oct 1959 - 16 Jan 1960. Previous Frew appearances: #169, #275, #418, #588, #794, #1216. 56th Sunday newspaper story; 30 Oct 1960 - 26 Mar 1961. Previous Frew appearances: #437, #612, #819. 80th daily newspaper story; 27 Feb - 13 May 1961. Previous Frew appearances: #195, #306, #455, #630, #843. 57th Sunday newspaper story; 2 Apr - 13 Aug 1961. Previous Frew appearances: #435, #608, #815. 90th daily newspaper story; 14 Dec 1964 - 17 Apr 1965. Previous Frew appearances: #302, #450, #621, #831. 94th daily newspaper story; 30 May - 10 Sep 1966. Previous Frew appearances: #340, #493, #671, #886. Once again we commence a new year with another Annual Special, 2001 Annual Special, being the 11th in the series. This year there are ten stories plus another reprint from the Frew archives - Issue No 10 which was published in 1949. As explained many times in the past, the early Frew editors "specialised" in inventing story titles! 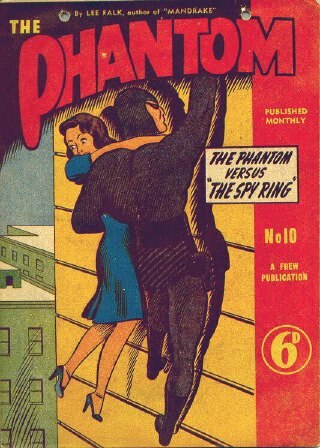 The reprint carries the title The Phantom Versus The Spy Ring on the front cover, but to save any confusion, the adventure is actually Part One of The Seahorse . Before you open the replica issue, a word of warning! Issue No 10 has a landscape cover. Be careful! With the exception of the story, The Shipwreckers all the adventures contained in this Annual Special are from the classics file and in most cases, have been out of print for up to 16 years. All of them are presented in their entirety for the first time in a Frew edition and all have been assembled from new copies of the original art. Covers for this Annual Special are by "Tessa". The identity of the cover artist commissioned to render the art for issue No 10 remains a mystery. It's a pity such records were not kept, but we continue the research in the hope that one day we can reveal the names of all the artists who produced cover art prior to the late Tommy Hughes, who took over the task for what must be a world record number of years spanning something like 1957-1987. The special editorial feature which follows the final page of the Lee Falk / Wilson McCoy classic, The Childhood of The Phantom , explains that this Sunday story was the second to pursue the theme and has not been in print since 1986. The first Sunday story about the growing up of the 21st Phantom was entitled The Young Phantom and was last seen in a Frew edition in our 1994 Annual Special. Debate still rages about which was the better version, but for the record, I prefer the story contained in this years special edition. 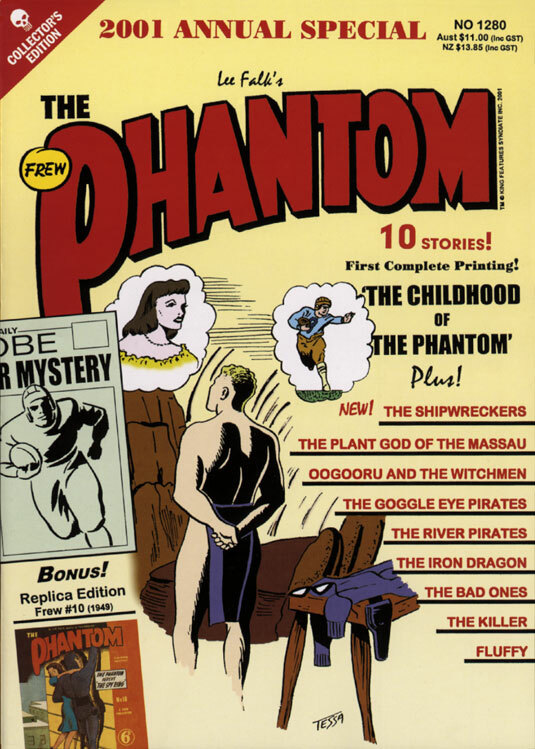 The two Sy Barry stories in this issue were chosen not only because they were well overdue for reprinting, but because they highlight the formative early years of Barry as he finetuned his style on The Phantom. Examine both The Bad Ones and The Killer and you will pick up two interesting things - Barry's use of many of the touches used by master comics artist Alex Raymond (one of the most admired and copied creators in the history of comics) - and the fact that Sy was still coming to grips depicting Devil! Both stories originally appeared in the mid-1960s and at that stage Sy had been working on The Phantom for barely four years. His style and especially his rendering of The Ghost Who Walks, was to become more detailed in later years. Jim seems to have forgotten about the reprint of Oogooru and the Witchmen in #1216, only two years ago. You can add this to the publishing details shown on pages 4 and 108. #1250 contained The Magic Ivory Cage by Bill Lignante, but this has not been included in any of the lists. #1252 Tiger Girl and #1264 Queen Pera the Perfect were Lee Falk stories adapted by Ulf Granberg. #1262 Viva Las Vegas was written by Tony De Paul, not César Spadari. #1264 The Treasure Hunters was written by Tony De Paul, not Lee Falk. #1270 The Strange Bank Robber was written by Claes Reimerthi, not Lee Falk. #1279 The Secret City was written by Tony De Paul, but is not credited in the lists. #1279 is shown twice in the Best Selling Frew Issues list. Heiner Bade drew 3 stories not 1. A more accurate publishing chronology for 2000 is available here, in addition to Frew in 2000: The Year in Review. Teaser: At an auction in Morristown, Diana Palmer-Walker buys a dagger bearing the Singh mark ... which quickly lands her in serious trouble. My thanks to the staff of Frew Publications and Egmont Serieforlaget for providing this information. Frew in Review: 1997, 1998, 1999, 2000.